Over the years, we have gone to great barbecue. This time great barbecue has come to us. John Lewis, the Texas-born pitmaster who spoke with us recently, will be bringing Central Texas BBQ to Charleston when he opens Lewis Barbecue in “late 2015.” Indeed, we rode by what will be his new place on the corner of Nassau and Isabella St. recently, and it looks pretty much the same as it does in this Google StreetMap view from January 2015. Fortunately, Charleston and we did not have to wait until late 2015 to enjoy Lewis’s BBQ. Starting June 6th running through Sept. 5, Lewis and Revelry Brewing are teaming up for a Summer Barbecue Series. Revelry brewing is on Conroy St. just a couple of blocks over from Lewis’s eventual home. 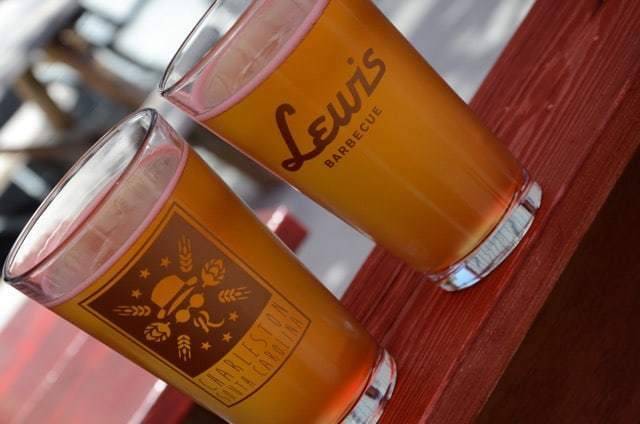 Together, they brewed a new beer, named “Lean or Fat,” to complement Lewis’s barbecue. We missed the opening Saturday, but we were able to go to the second event in the series. We arrived around 11:20 am for the 12 pm opening. At this point, we were about the fifth group in line, about 15 people back. The Revelry crew was busy getting set up, and Lewis and his crew were busy as well. They were packing brisket and pork in butcher’s paper to put in the warmer, and pulling links off the huge pit he brought over for this event. We each got a Lean and Fat to cool us down on what was already a hot summer day. It hit the spot. Shortly after noon, Lewis was open for business. He took his station at the counter and greeted each customer. He would be handling all of the meat orders. As each new group stepped up, he cut each person a small chunk of brisket to try and then took their orders. He then sliced, chopped or pulled whatever the order required, weighed it on a scale, called out the weight to the cashier to his left. Today, giant beef ribs were a special addition to the menu. We decided we wanted to try, well… everything, at least all the meats. We didn’t order any of the sandwiches. Next was our turn. We stepped up and tasted the gift of brisket chunk. Extraordinary. Lewis pulled out two huge ribs, cut one from the other, and offered me my choice of the two. I took the “smaller” of the two and even that turned out to be $28. It was fantastic (more about that later), but $28 for one rib is a lot, needless to say. I don’t know that I would get another one next time, but I am pleased to have tried it today. He placed the rib on a black plastic tray covered with a reddish butcher paper and continued with the order: slicing the hot guts into about 4 pieces, and pulling and weighing ½ lb of pork from the warmer. He suggested adding some pickled onions for the pork (and we’re glad he did) and handed the tray to his assistant who completed the order with the requested sides. Lewis quickly added a couple of slices of white bread (more from Pepperidge Farm type loaf than a loaf of Sunbeam). We took our tray yet another step down the line, where we filled little cups with sauce, added a spoonful of what appeared to be dill pickles chunks, grabbed a few utensils and napkins. We then made our way back down and around the line, to the envy of all the gawkers watching as we passed, to find an open spot at one of the many picnic tables Revelry had provided. We refreshed our beers and added a couple of bottles of water and sat to enjoy our meal. The extraordinary is obvious from the first bite in any great food you might sample. So it was here. The barbecue was simply fantastic. Lewis may alter that vocabulary. He has stepped out of Central Texas, where “barbecue” must be a more encompassing term, and I suspect his arrival will change not only our perception but along with it, our lexicon. Great food is great food, and it will always be appreciated no matter where it is served, but I would argue Lewis couldn’t have picked a better location in the state in which to begin to alter that perception. Charleston, interestingly enough, does not have a rich barbecue heritage. Couple that with the fact that it is arguably the most accepting of new food ideas of any place in the state, and you have a great recipe for this new ‘cue. Anyway…back to our tray of….yes, barbecue. I had to begin with the brisket. In all honesty, brisket is new to me. I may have eaten it half a dozen times in my life that I am aware of, and most of those involved a crock pot. The first barbecued brisket I tried since we began this site was at Kelly’s BBQ in Summerville, not very long ago, so I have no expertise in the subject. Of course, we claim no real expertise on even pork barbecue. We just share our honest opinions and experiences and invite you to share our journey. “It had nice coloring to it. The fat that was on it, even though it was a nice big layer, was not….fatty. It added to the flavor of all the other meat,” Heather commented. Note that neither of us can stand soft, fatty tissue in our BBQ. It is very unpleasant, but this was something totally different. The fat layer was…necessary, and it added both flavor and moisture to the beef. Without it, the experience and depth of flavor would be lacking. Something happens to the fat on the pit. It becomes rich…succulent…unctuous. Unctuous is apparently a controversial culinary term. Outside of the food world, the term is definitely negative, meaning oily or greasy, as in the unctuous used car salesman who tries to “butter you up” but is just a greasy lowlife. But in the culinary sense, to me anyway, unctuousness implies a certain smoothness born of dissolved fats and soft tissues that lend a certain richness to a dish. Not at all unpleasant; quite the opposite, actually. So when I say the brisket, and especially the giant beef rib and, frankly, even the pulled pork was, in fact, unctuous, please know that is a wonderful thing. “What did you think of the brisket? You don’t like beef…” I asked Heather, curious. “I did and it was phenomenal,” she said. “I thought that one had a real beefiness to it,” I pointed out. “I only had a small piece because you ate so much of it…” Heather complained. And well she should have, as I was a bit overzealous in my enjoyment of the food. The beef rib was huge. I have to say the texture and beefiness reminded me more of a delicious beef stew than the rub-covered pork ribs I am accustomed to. It was just so moist and tender. “The beef rib was very tender — everything was very tender and juicy,” I noted. “It was fantastic,” Heather agreed. But the link we enjoyed was definitely not hot, but like all the other meats, it was fantastic. As mentioned above, Lewis does offer sandwiches (of which Heather’s is not yet an option). The El Sancho has the pickled red onions and hot gut sausage Heather wanted, along with either chopped brisket or pulled pork….make it “loco” with all three meats. If I remember correctly, the sandwiches were in the $9-$10 range, and definitely worth it based on size alone. Finally, the pulled pork. Now we’re back in familiar territory. I will say, this is an exceptional pork barbecue. It was phenomenal. It is simply the best pork we have tried in Charleston (though we have lots left to try) and without question in an elite tier of all BBQ in the state. It is not a traditional SC BBQ, but that is not a bad thing. What it is is moist, flavorful pork, rich in flavor. And while the beef products were fantastic, without question, we prefer pork. Indeed, the sauce was irrelevant for any of the barbecue we enjoyed. “We had lots of BBQ sauces to choose from and other than tasting each BBQ sauce, I don’t think we used a bit of it,” I pointed out. All of the sauces, and there were several to choose from, tasted great on their own. We did sample each of them, but honestly, we didn’t use a drop on any of the meats. Simply wasn’t needed. The potato salad “was just like Jim’s grandmother’s; not too much mayonnaise….perfect,” Heather said. “Yea, it was really good, but I didn’t get many bites of it….” I complained. Heather smiled. “The coleslaw, you felt had too much mayonnaise in it, but I didn’t think so. It wasn’t in like some mayonnaise sauce,” I continued. “So I’m not mayonnaise coleslaw person,” she noted. Bottom line, neither of us care for mayo that much. We had two types of pickles on the tray: the red onion pickles Lewis suggested to go along with the pork and the dill chunks we took from the self-service area. The dills were “definitely not a bread and butter. And it was a good palate cleanser, too, to the beef,” I said. “They were spicy and vinegary, and they went great with the pork,” she finished. In the end, a new barbecue has landed on Charleston’s shores and while it was born of a different tradition, there is no denying it is already among the best the state has to offer. 2) Also, no mayo in the slaw. The base is lemon juice and sour cream. Again glad to have you guys over, and happy to hear that our sausage isn’t too spicy for South Carolina! !